Born on 15 January 1891 in Cheshire, England - son of Charles and Mary Elizabeth Fiedler, London, England - at the time of his enlistment in 1916: present address in Toronto, Ontario, trade as clerk, single, no current or previous military service, Presbyterian, height of 5 feet 2.25 inches, chest of 33.5 inches fully expanded, dark complexion, brown eyes, black hair. 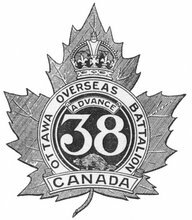 Joined the 109th Battalion, CEF, in Lindsay, Ontario, on 15 February 1916 (number 725240) - taken on the strength of the 38th Battalion, CEF, on 4 or 6 December 1916 - killed in action on 9 April 1917 - name inscribed on the Vimy Memorial, France. (Updated with a photo of Pte Fiedler's inscription on the Vimy Memorial that I took in August 2012). THANK YOU! Thru the family genealogy, I have tried to commemorate Cecil as best I can. Cecil was the beloved older brother of Claude, my grandfather who survived every battle but the last one which the Canadians fought in. He was injured three weeks before the war ended. Claude married in 1922, had five children and 11 grandchildren and died not long before his 100th birthday. He well made up for the years Cecil never had. I have photos if its possible to add such? Thank you for the additional information! Yes, I can add photos to the blog entry if you can send them to me digitally (my e-mail is militaryhistorian@gmail.com).